To get to this view, first select Sample Comparison View in the View Combobox in the Data Selection Bar. Next, select the comparison that you wish to investigate using the DataSet Combobox also in the Data Selection Bar. 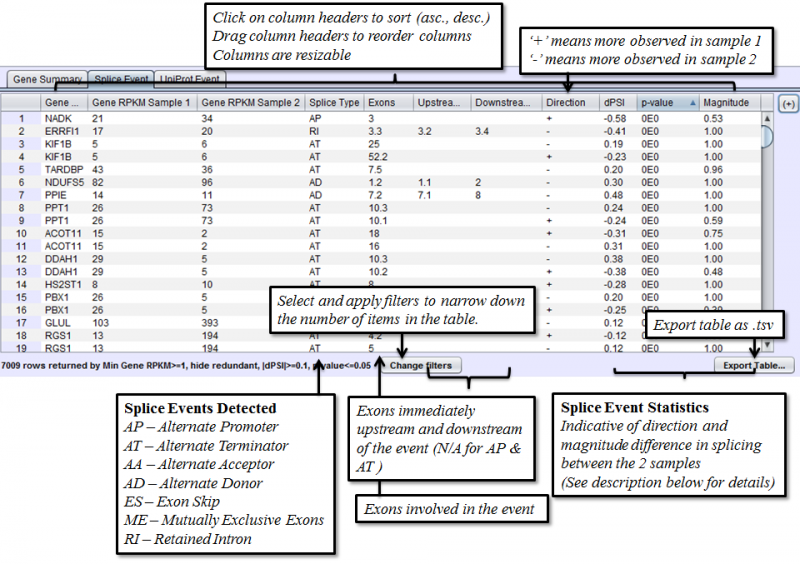 When the comparison loads, the Results Panel will be loaded with all the splice events identified in the chosen comparison. 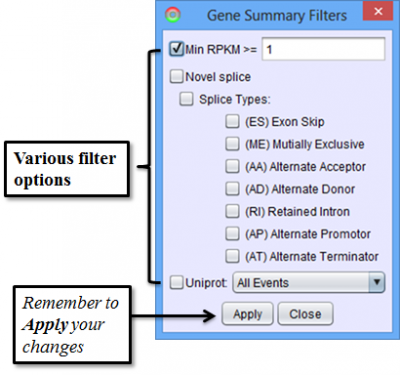 Gene Summary Tab of the Results Panel allows you to sort, filter, display, and export the results for each gene in the currently selected comparison. Gene RPKM Sample 1 - overall Gene Expression level of the first sample. dPSI - Delta Percent-Spliced-In. The PSI of the second sample minus that of the first sample. p-value: Calculating on a 2x2 Contingency table, using Fisher’s exact test. Chi-Square approximation is used for larger numbers. 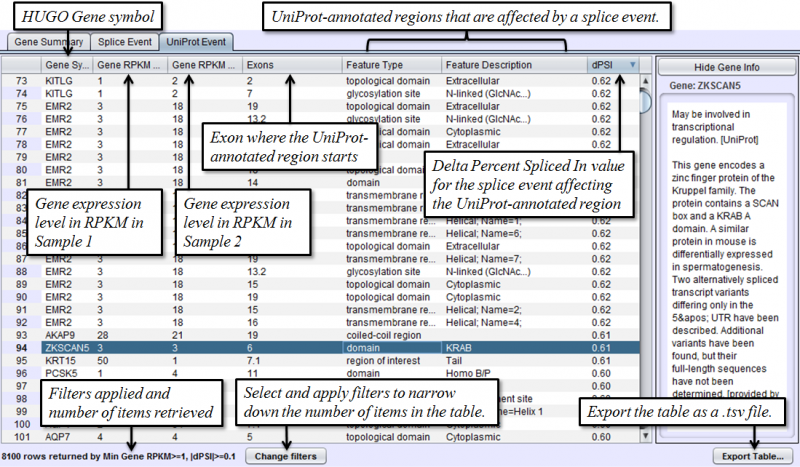 Portions of the graph drawn in gray indicate that the exon/splice is expressed at equivalent proportions in both samples. 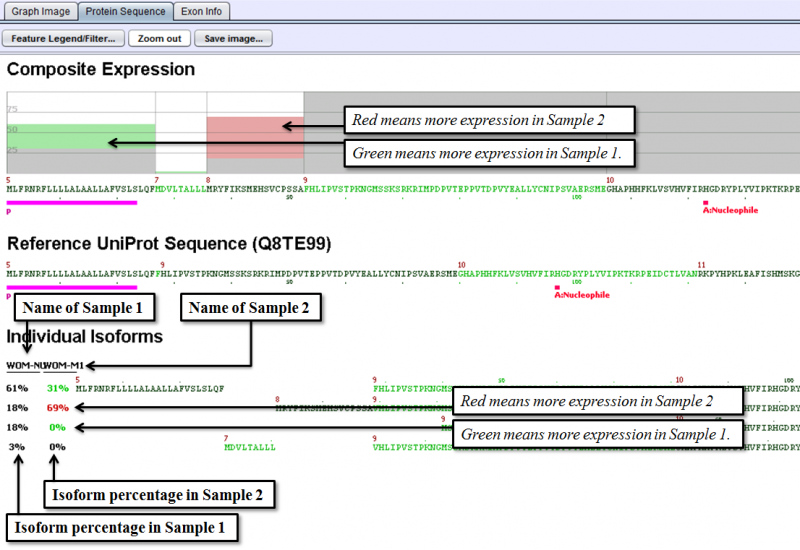 Splices or exons drawn in red are expressed at a higher proportional level in the second sample; those drawn in green are expressed at higher proportions in the first sample. OPKM - Observations Per Kilobase per Million reads. 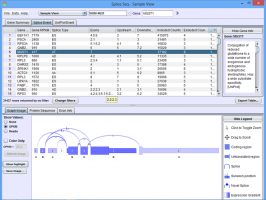 OPKM is the total number of reads overlapping each exon / splice normalized for length and total number of aligned reads in the sample. 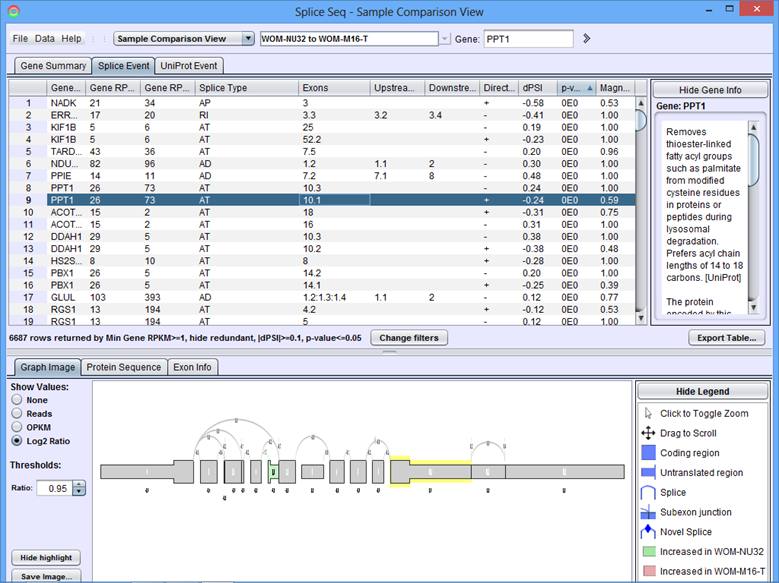 The length used is the window size in which a read may overlap the exon / splice. 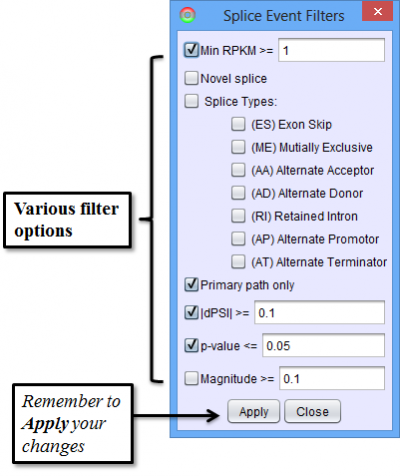 This normalization allows for cross exon or cross sample comparisons. Log2 Ratio: The log2 value of the ratio of normalized sample 1 OPKM over normalized sample 2 OPKM. This value represents the magnitude of difference between the samples after correcting for any differences in gene expression levels. 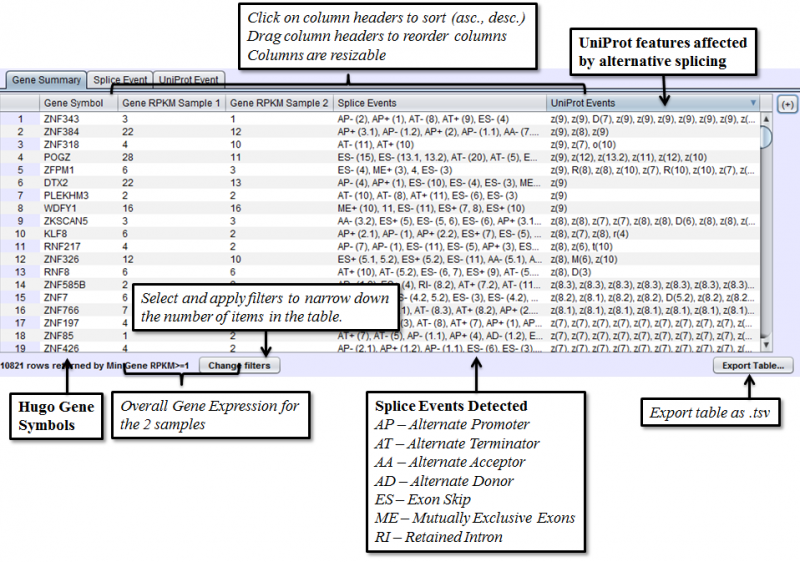 Positive number indicates enrichment in sample 1, negative number indicates more enrichment in sample 2. The below example shows that a nucleotide phosphate binding site on exon 1 is expressed more in Sample 1 than in Sample 2 and dramatic increase in the percentage of the isoform that starts at exon 8, from 18% in Sample 1 to 69% in Sample 2.